Do you know what is utterly amazing? Peering out the tiny window of a massive commercial jet, whilst drinking coke zero above the shimmering lakes of western Canada. Then all the sudden you are flying over a frozen tundra. Are those ice peeks or snow-covered mountains? You cannot tell. Is this Alaska or Eastern Russia? Who can say. All you know is that for 23 years you lived on this planet and only now are beholding some of its breathtaking wonderlands. And when your naked eyes behold the beauty of untold lands, nothing is more important than savoring this single moment. Flying is an amazing sensation. I spent fourteen hours on a plane to South Korea. 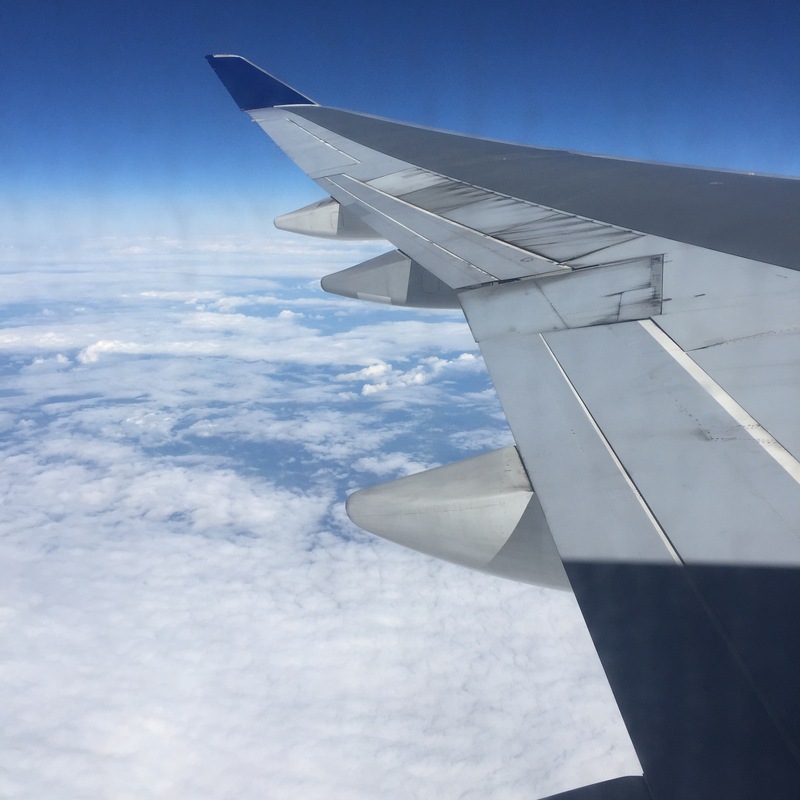 As the plane tilted and I had a chance to see beyond its giant wing emerging from the base beneath me, I looked out at the end of the world where stratus clouds played tag above the cumulonimbus. In fourteen hours I would fly from one side of this enormous planet to the next. Flying, soaring above 30,000 feet of air and space and water. For Fourteen hours we chased the sun as it raced across the sky, illuminating the miles upon miles of earth and sea below. For fourteen hours the plane rattled and rumbled through the stratasphere, rocking back and forth, lulling its passages to sleep. The never-setting sun glowed against my passenger window. My body grew hot, pressed against the heated wall of plane and air. The woman beside me slept with her hands folded over her lap, blocking my way of escape. My legs began to ache, my ankles to swell, my feet to cry out, “take us somewhere, anywhere but here.” I rubbed them impatiently until the flight attendants came rolling down the isle with goods to share. Im sipping coffee above the clouds. Its 4:00 in the morning at home but I don’t care. The sun is awake. It endured the journey without going to sleep, so should I. The best part about writing a story is writing the second draft. But there is nothing I love more than looking over the pages I typed yesterday, and beginning the second draft. But I thought about it for a while and realized, no, writing doesn’t come easy for me. I think that anyone can be a good writer, if they spend enough time with their writing. Good writing doesn’t spill out of the mouths of poets and novelists. It develops over time. I hardly doubt Shakespeare penned the lines of Romeo and Juliet on the first draft. I imagine he read them aloud over and over, changing an adjective here and a noun there. So a word of encouragement to my fellow aspiring novelists. Get your story out before you begin editing. Don’t stop simply because you feel like it’s bad writing. You always have time to go back and polish. In college I took a fiction writing class. It was a time in my life where I learned how to take a blow from another writer. The structure of the class was one where we read our stories aloud and then we’d critique each other. Sometimes our professor had us swap stories with a random person in the class and we’d critique their story, then bring it in to class and read it aloud the following week. One afternoon I walked into class, sat down, and riffled through my folder for the story I’d critiqued the night before. My hands searched unsuccessfully as, to my immediate alarm, I realized the story was still back at my dorm. With two minutes ’till the start of class, I slipped out of the room and dashed down the hall. My dorm was five minutes away, but I ran the whole way with my ponytail whipping behind me. Students passing by, side-grinned at me, but I ignored them because they’d probably been in a similar situation at one point or another. The dorm was empty. Most everyone was in class by now. I ran down the hall and almost collided with a girl coming out of the bathroom wrapped in a towel. “Forget something?” she hollered after me. “Of all the days!” I yelled back. There it was, sitting on my desk, marked with purple ink. I snatched it up and hurried back to class. The door was closed when I returned. This was a sure sign I was extremely late. It also meant someone’s story was being read. The cold door handle clicked opened as I held my breath and entered. The words that filled the room as I searched for a seat took me by surprise, for it was my story that was chosen first, my story that the student up front was reading. My story that I’d crafted so carefully, penned so precisely, typed so timidly. Of all the stories. She read on, and to my surprise the class was captivated, even the professor listened intently, eyes down, fingers folded in his lap. The girl reading my story was nearly to the last page, when she stopped right in the middle of some well-written dialogue. I looked up, in bewilderment, wondering why she’d failed to read the last page. But no one else seemed to notice. The professor asked for some critique and critique was given. “Yes, but what did you think of the story?” the professor prodded. I was beginning to feel nauseous, realizing that in a few minutes I’d have to admit that this half-finished story was mine. The only conclusion I could draw was that maybe I’d failed to print the last page, when I had turned it in the week before. Maybe the printer ran out of paper. Maybe I’d only grabbed the four pages and left the fifth one alone on the printer. Oh, did my stomach churn. Thankfully the professor liked my story and gave it some very constructive criticism. The class asked who the author was and I raised my hand, reluctantly. “Where did you get the idea?” the professor asked, and all eyes turned to me. My forehead was damp with sweat, my palms were itchy, and my feet were still hot from the jog. What is worse than presenting a half-written story, a half completed assignment, a partially finished task? I sometimes struggle with living a partially finished life. A life that is still moving, still going, still sitting out in the world with an end in sight but an unseen future. I like to think of my life as a story. But it’s scary not knowing where this protagonist is going to end up. I sit at the edge of my seat in the middle of a life where bad things keep happening. I’m a storyteller. I know every story needs conflict, but keeping an objective outlook is hardest when you’re the main character. How many of Jane Austen’s novels have you read, and do you have a favorite? Interestingly enough, the novel I’m writing now is hinted with themes of Jane Austen. I’ve read Pride and Prejudice, Mansfield Park, Persuasion, most of Sense and Sensibility and some of Emma. My favorite by far is Persuasion. Who are your fictional crushes/ships? Atticus from To Kill a Mockingbird. But he’s an old man, so maybe a friend crush. Movie and TV characters are easy to crush on but the one’s in storybooks have deeper characters. Americanah, by Chimamanda Ngozi Adichie. This book is by a Nigerian author who creates characters of color. Her storytelling is brilliant, like nothing I’ve read before. Eat, Pray, Love. Though she doesn’t have a great worldview, the author has a wonderful voice in her writing. The Soloist is also a good read if you’re looking for something thought provoking. But for something more substantial and less entertaining, then Augustine’s Confessions. What are your favorite historical periods/settings? Which are your favorites to write about? I prefer modern day. I like to intertwine current issues into my stories. But previously I liked the Romantic Era. Settings are fun to play around with, but I find it easiest to write about where I’ve been: France, England, Upstate New York, and of course Indiana. How do you write—pen and paper, computer, etc? Always on a computer. The words flow better there. But when I have an idea and need to get it out quickly, I use a small journal to put the words down. Sometimes, for a blog post, I’ll come back to the notebook and copy it down. What’s your favorite period drama miniseries? Favorite TV show? I was captivated by Suits, until Netflix took it off. Otherwise I loved watching Downton Abbey, before it got too depressing. Jane the Virgin is hilarious and well written. But don’t judge me when I say my favorite TV show is the Great British Bake Off. Baking as mentioned above is a huge hobby for me. Mostly because it’s a great stress reliever, especially now that I’m working and out of school. Exercise is also my go-to when I have some down time. You mentioned travel, so…how many places have you visited, and what was your favorite? Any special place you have still to visit? Places? Too many to mention/not enough to satisfy my travel fever. Four countries, soon to be five. #Southkoreabound. My favorite has to be York, England. A city I lived in for five months during a study abroad. Still need to visit my sister in Taiwan, and probably my brother in China. I also really want to see Edinburgh, Scotland. And my family’s country, Rwanda. What are your favorite coffee shops? Starbucks, but I’m partial because I use to work there. Costa in the UK is nice as well. But if I wanna be hipster I guess I’ll mention some local ones: Thirsty Scholar, Quills, Quirky Feather, and Pia Urban Cafe.